The current collection of seminars from the well remembered mecca of beer festival rioting, Newton Abbot. 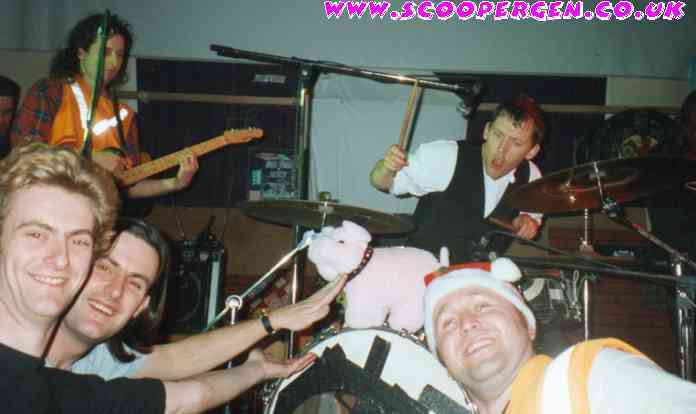 As if the combination of intense sociability from Dean and Teresa and a superb festival was not enough, when Phil White ran the famous Lock Stock and Barrel xmas parties, it really was the scooper's Ibiza !! (well, it's near the sea I suppose). Add to this the late lamented Star Balti, and you have a recipe for much rioting. Which is exactly what happened! I'm not sure if any of us have ever thanked Dean and Teresa for putting up with us all rioting and taking over their house, so a big "Cheers" from me, and I'm sure many others who fondly remember the "old times"! Gen How a proper "pyramid" seminar should be! The LS&B party was one of the highlights of the scooping year! Location / Date LS&B party, Newton Abbot, December 1996. Personnel Jason, Dai, Babe the pig Gazza and Blyth Power. 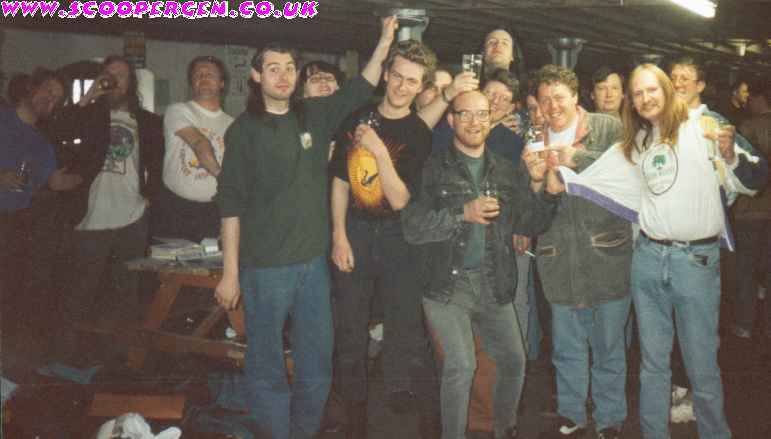 Gen One of the top bands ever, Blyth went through a phase of playing beer festivals - usually booked by scoopers! Gen The usual drunken rioting at Newton Abbot, sadly not seen any more ... at least not like it used to be! Eeeee, makes me feel old! 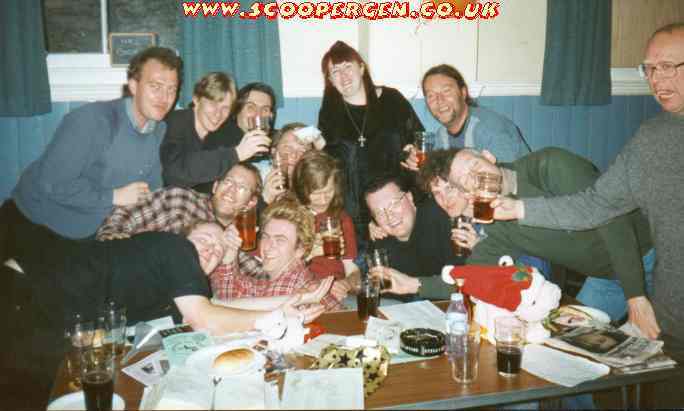 Personnel Fletch, Bratley, Gazza, Alex, Sue, Jason, Aston, Russ, Spoon, Phil Rennison, Nige, Tim from Telford, Nice Hair and ? Gen A well riotous venue for a beer festival, with a mass seminar to prove it! 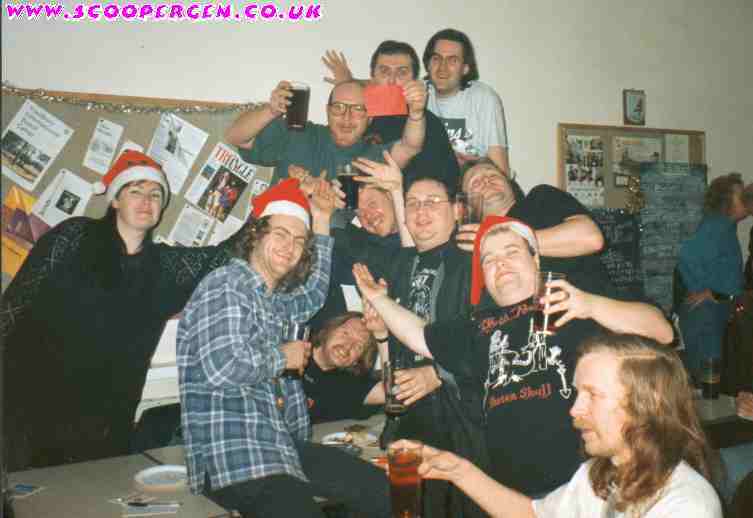 Personnel (top row) Jason'a mate, Skeletor, Dai, Sue, Badger, Brian Francis. (Middle row) Beavis, Fletch, Bratley, Steve, Simon Fyffe and Jimmy Hill. (Bottom row) Ding Ding and Jason. Gen A superb seminar with many top people present!